Feeling on edge? Take the ultimate chill-pill and enjoy total stress relief! With our guided visualization, we’ll take you to a quiet, peaceful place beside a mountain stream. Listen to the water burbling over a bed of stones, carrying all your anxieties away with it. Breathe in the cool, clean mountain air, and feel your worries start to dissolve. You'll soon feel completely relaxed, refreshed, re-energized. Whatever your situation, you’ll be an oasis of calm in the middle of it. 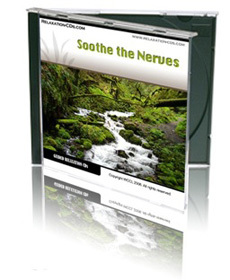 And any time you need your nerves soothing again, all you’ll have to do is put on this CD to return to your secret haven!